BMW M is presenting another exclusive, limited-run special-edition model in the shape of the new BMW M3 CS with 10 extra horsepowers, raising it to 460 hp, over the regular version. With its accentuated sporting presence, the new M3 CS continues the decades-long tradition of successful M special editions which began in 1988 with the E30 BMW M3 Evolution. At the same time, the four-door high-performance sedan serves up a perfect blend of dynamism and everyday practicality. The 3.0-litre high-performance engine exceeds the output of the M3 with Competition Package by 10 horsepower, raising it to 460 hp. State-of-the-art M TwinPower Turbo technology propels the M3 CS from 0 to 100 km/h (62 mph) in just 3.9 seconds. The top speed of the new special edition, which comes as standard with the M Driver’s Package, is electronically limited to 280 km/h (174 mph). With its two mono-scroll turbochargers, charge air cooler, High Precision Injection, Valvetronic variable valve timing and Double-Vanos fully variable camshaft timing, the six-cylinder in-line engine takes a clear and consistent aim at the higher echelons of performance, but is equally committed to developing significant torque from low engine speeds and achieving high levels of efficiency. Pushing the new red start/stop button fires up the engine, and the distinctive sound produced by the specially tuned sports exhaust system of the new BMW M3 CS – with its quartet of tailpipes - proceeds to lay on a feast for the ears. 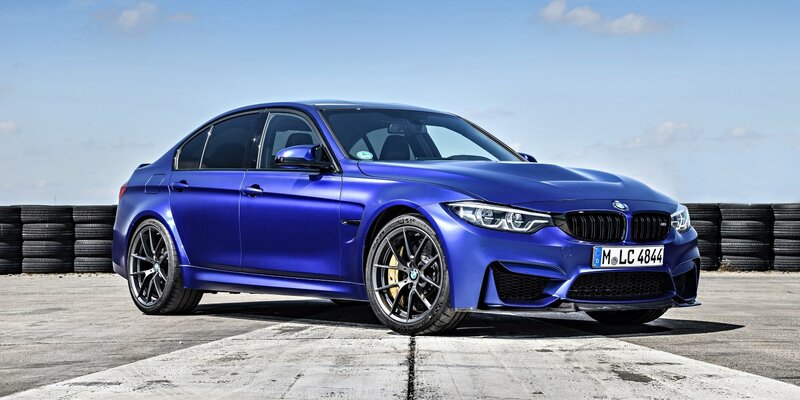 The suspension of the new BMW M3 CS largely mirrors that of the M3 with Competition Package. The links and wheel carriers at both the front and rear axles are made from forged aluminium and are therefore extremely light. That keeps the unsprung masses low and benefits driving dynamics. The M3 CS is fitted as standard with Adaptive M suspension, whose geometry has been tuned to deliver optimised performance on both the road and track. Ensuring the best possible grip in all driving conditions are the DSC (Dynamic Stability Control) system - which includes M Dynamic Mode - and the Active M Differential. The control systems for the Adaptive M suspension, DSC and Active M Differential have been modified to suit the dynamic requirements of the BMW M3 CS, as has the set-up of the electromechanical steering. The driver has the option of adjusting the steering and suspension settings to their personal preferences or the demands of the route at hand. The special edition’s light-alloy wheels (front: 9 J x 19, rear: 10 J x 20) are very much at home on the race track, fitted as they are (as standard) with Michelin Pilot Sport Cup 2 tyres (front: 265/35 R 19, rear: 285/30 R 20). These semi-slick cup tyres, which are also road-legal, provide unbeatable grip and supreme lateral stability at high track speeds. The M3 CS can also be ordered with Michelin Sport road tyres.